The grass genus Diplachne only includes two species, but it the does not fall short when it comes to remarkable features. It was precisely this affinity to the unusual displayed by the nearly worldwide genus that inspired Dr Neil Snow and his co-authors to delve deeper in a dedicated monograph published in the open access journal PhytoKeys. Occuring widely on all continents except Antarctica, Diplachne fusca, one of the two known species, is by far not just another grass species, with two of its four subspecies displaying high salt tolerance. Even more intriguing is the discovery of a German research team from the 1980s, which discovered that some populations from southern Asia harbor a nitrogen-fixing bacterial species, which when described was new to science. 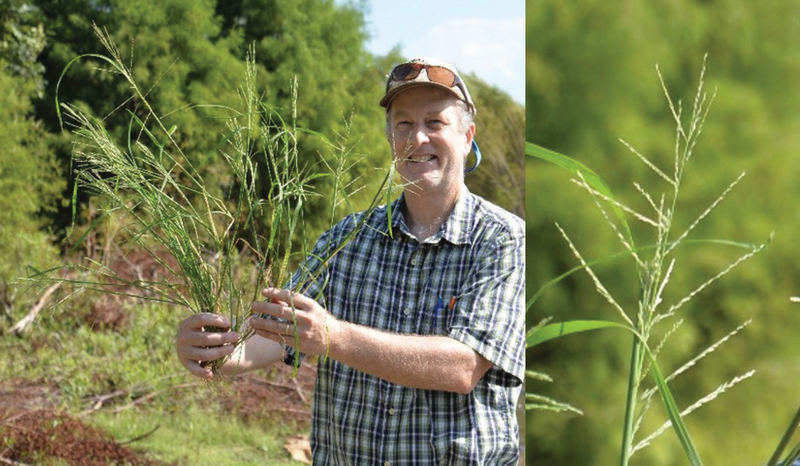 “The combination of nitrogen-fixing bacteria and high levels of salinity tolerance is unknown in others grasses, at least that I am aware of”, explains Snow. In significant contrast, the second species Diplachne gigantea is restricted to small pockets in Africa. Having been collected only a few times and not since the early 1980s, the enigmatic plant is an emergent species, meaning its roots are in the water but upper portions typically extend well above the surface. “I spent two long and hot days in a boat in the Okavango Delta in Botswana in 1996 looking for this elusive plant, but regrettably without success”, comments Snow on his attempt to encounter Diplachne gigantea in its natural surroundings. “Given the widespread potential habitat in the Okavango, it seems odd the species is collected so infrequently, but it may well be that it is quite rare”. Snow’s colleagues at the Smithsonian Insitution, Drs. Paul Peterson and Konstantin Romaschenko , included a molecular phylogenetic analysis of 21 individuals of Diplachne, which indicated that while the genus is monophyletic, some accessions of the four subspecies of D. fusca are in fact polyphyletic.